2X-Large Waist Size 52 - 59" Medium Waist Size 27 - 35"
AllegroMedical.com offers The The XBACK PROLIFT-PLUS LSO Brace. 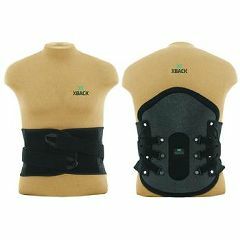 The XBACK PROLIFT-PLUS is a unique one piece LSO brace that immobilizes the wearer from the sacrococcygeal junction to above T9 vertebra. Lateral stability is provided by rigid lateral panels in the side of the brace. The Prolift-Plus's unique split front panel helps center the brace on the abdomen while providing intracavitary pressure / hydrostatic lift to reduce load on the intervertebral discs. This model is now available as an adjustable brace. T109XXLG - 2X-Large Waist Size 52 - 59"
T109MED - Medium Waist Size 27 - 35"